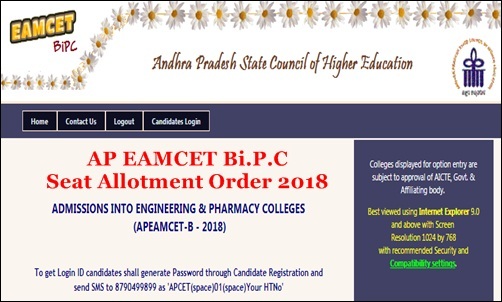 AP EAMCET Bi.P.C Seat Allotment Results 2018: Andhra Pradesh EAMCET 2018 allotment result of Bi.P.C is scheduled to release today, 4th August. Hence hopefuls who have come across the certificate verification process from 31st July to 3rd July can now check the AP EAMCET Bi.P.C seat allotment result from the AP EAMCET official website, apeamcetb.nic.in. Aspirants who allotted admission will have to report at the allotted colleges as per the scheduled dates. The AP EAMCET Bi.P.C seat allotment will be liable on the basis of rank obtained by the hopefuls. Hopefuls who have attended the document verification round as pe their ranks can check the seat allotment result and other details from the following article. Andhra Pradesh State Higher Education Council APSCHE is responsible to conduct the Engineering Agriculture Medicine Common Entrance Test (EAMCET) examination annually. Jawaharlal Nehru Technological University Kakinada conducts the EAMCET examination on behalf of APSCHE. The EAMCET examination is conducted in many examination centers across the state. Hopefuls aspiring to get admission in Engineering, Medicine, B.Pharmacy, and other courses compete for the EAMCET entrance test in the state of AP. Jawaharlal Nehru Technological University Kakinada (JNTUK) has successfully completed conducting the AP Engineering Agricultural and Medical Common Entrance Test (EAMCET) 2018 on 22nd to 25th April 2018 (Engineering), 25th to 26th April 2018 (Agriculture) & 24th to 25th April 2018 (Both Streams). While the JNTUK has declared the results for MPC and Bi.P.C branches on 8th May. The AP EAMCET Bi.P.C counseling process was held from all the ranks from 1 to LAST from 31st July to 3rd August. And the document verification was carried out from 31st July to 1st August at Andhra Loyola College Vijayawada for all groups PH, CAP, NCC, Sports & Games, Anglo Indian. Aspirants who had appeared for the AP EAMCET document verification and web counseling rounds can now check the AP EAMCET Bi.P. C seat allotment result on the AP EAMCET Bi.P.C portal, apeamcetb.ni.in. Hopefuls allotted admission in various MBBS and BDS courses can download the seat allotment order from the AP EAMCET Bi.P.C website, apeamcetb.nic.in. Hopefuls will have to take the printout of the seat allotment order to report at the allotted college. Candidates have to carry all the required documents and allotment order to report at the allotted colleges. On the homepage, the Bi.P.C seat allotment result link will be visible. Click on the link and enter the required credentials. The AP EAMCET Medicine seat allotment result 2018 will be displayed on the screen. Check it and download the seat allotment order by tapping the corresponding link. Take a printout of the AP EAMCET Medicine seat allotment order and preserve it safe for the further proceedings.